Enjaku (active 1856 - 1866) Portrait of Owari Dennai, c.1864. Chuban. We are fortunate to have this beautiful and exquisitely made print by the rare and enigmatic artist Enjaku. Enjaku was an Osaka printmaker who produced around 140 deluxe prints which survive in very small numbers and are difficult to obtain. Although nothing is known about his biography, he is arguably the most important transitional artist entering the last phase of printmaking in Osaka. His prints are characterised by luxurious techniques - metallic pigments, embossing, colour blends and multiple printings. Often his work was privately commissioned hence the short print runs and the fine quality of the carving and the impressions. This is one of Enjaku's designs for the series Nanatsu iroha (Seven syllables of the Japanese alphabet), a group of prints that he co-designed with Kunikazu and Yoshitaki, which were all published by Ishiwa. This deluxe-edition set was issued for various performances circa 1857-1865, plus a few mitate ("view and compare," or analogue pictures) for imaginary productions. Each design included seven different ideograms or kanji pronounced the same, either matching the pronunciation of the first character of the actor's role or suggesting an alternate association with the actor, role, or play. All the designs include a hand scroll at the top with the actor's name (if included), play title, and series title. Enjaku's signatures on his designs are placed in either the scroll or the background behind the actors. 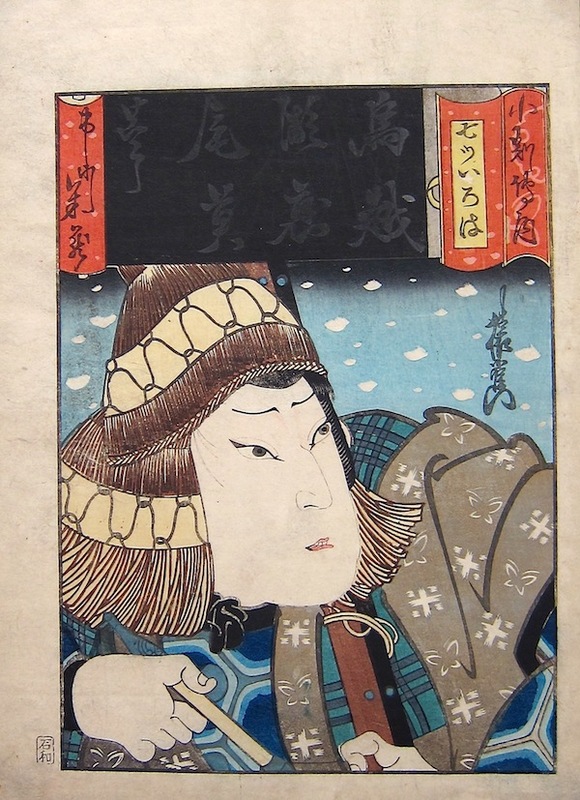 Enjaku's print features Ichikawa Yonezô III as Owari Dennai in the play Katakiuchi ura no asagiri (Revenge along the bay in morning fog: 敵討浦朝霧) performed at the Zama Theater, Osaka in 10/1864. This kabuki saga involved an attempted usurpation of the leadership of the Aboshi clan by a villain named Karahashi and his son. Dennai, a hunter and a relative of the true heir, was sent to terminate the plot. Enjaku's signature is at the far middle right. Ishiwa's mark is in the lower left margin. Yonezô's blue outer robe has a design composed of alternating "cross + wings" butterflies and "cross + dots kasuri" ("splashed pattern") that constitute stylized crests for the actor Yonezô. The cool blue and gray palette and the falling snow help to establish an atmosphere of cold determination appropriate to the plot of the play. A very fine print, gold metallic pigment, large margins and fine condition and colour.